Follow the instructions below on how to check the current firmware version that your device is using. Access the router’s web-based setup page. Open any web browser (Internet Explorer, Mozilla Firefox, or Safari®) and enter “192.168.1.1” in the Address bar then press [Enter]. You will be asked for your login details. Enter “admin” in the User name and Password fields, then press [Enter]. NOTE: If you are using older Linksys routers, the screen you have may be similar to the image shown below. The firmware version is located below the Domain Name. Windows 10 – Right-click the Start button then select Search. Enter “Linksys Connect” in the search field. Click the Linksys Connect icon once it appears on the results. Windows 8.1 – Right-click the Start button then select Search. Enter “Linksys Connect” in the search field. Click the Linksys Connect icon once it appears on the results. Windows 8 – Click the Search charm on the Charms bar then enter “Linksys Connect” in the search field. Click the Linksys Connect icon once it appears on the results. Windows 7/Vista – Click the Pearl button then enter “Linksys Connect” in the search field. Once the results populate, click Linksys Connect. 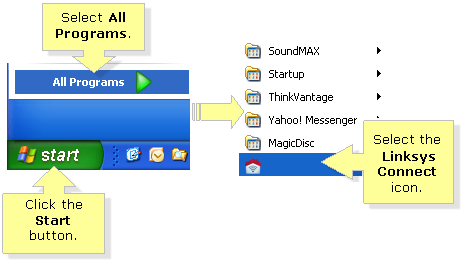 Windows XP – Go to Start > All Programs > Linksys Connect. Mac® – Click the Macintosh HD icon on your Desktop. On the window that appears, click Applications then click Linksys Connect. 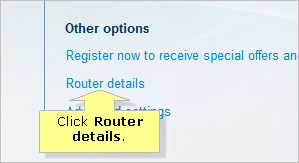 On the Linksys Connect main screen, click Router settings. In the Router settings window, look for Other options and click Router details. 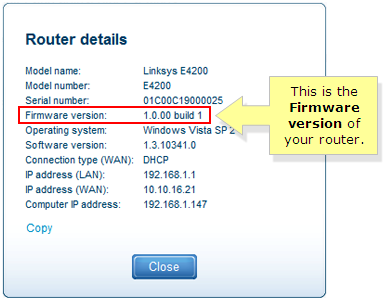 The Router details window provides important information about your router including the device’s firmware version.